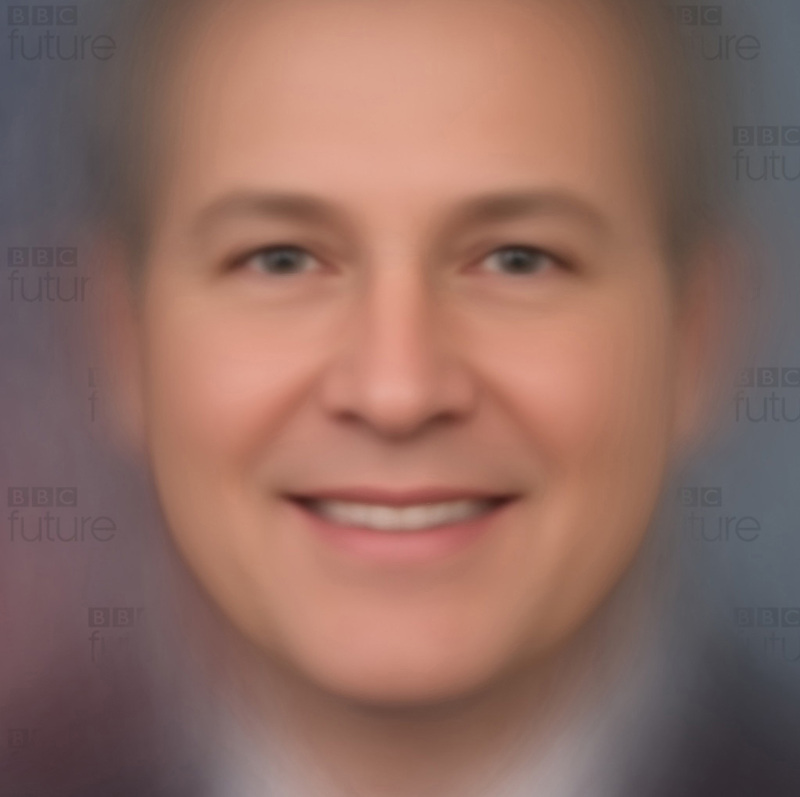 BBC Future created a composite face of all members of the US Senate and House of Representatives. Here’s what it tells us about US politics in 2017, and how the Democrats and Republicans differ. Take a close look at this face. Who do you see? We’d call him a clean-cut, middle-aged white man. He looks like a John, a James, or a Robert. Perhaps you’ve met him once: the husband of a friend, or a former colleague. Or maybe you’ve only ever seen him on television – people who look like him don’t mix in your circles. What you’re looking at is the face of American politics in 2017. He is a composite image of the US Congress: all 100 Senators and 435 members of the House of Representatives, blended into one. BBC Future decided to create the image because, in politics, faces matter. As Zaria Gorvett explores in this accompanying article, research suggests that people often vote according to how their politicians look. Appearances turn elections. Those we elect to high office also tell us who we are. In an ideal world, our politicians should be a reflection of our society – and of the society we aspire to have. After all, they are the leaders our children watch on the television: representing our values, steering a nation, shaping lives. If a young person looks at a screen and sees someone like them looking back, they believe they can one day do the same. Political scientists call it “descriptive representation”: a government formed of politicians with the same distribution of race, gender and background as its people. Studies suggest that it can lead to less alienation, higher voter turnout and greater engagement with politics. So, what does the face above say about the US – and what can it tell us about how closely American leaders mirror the people they represent? Today, composites are used to help researchers identify the specific features people associate with traits such as attractiveness, conscientiousness or trustworthiness. The face-blending algorithm works by marking 68 points on each face, including six points on each eye, 16 on the jawline and nine on the nose. This creates a face ‘fingerprint’ and is essentially the same approach as facial recognition software. We then used a technique called “Delauney Triangulation” to calculate the average position of all these feature points, as well as blending colours such as skin tone. The blended face that the algorithm spat out is, to put it bluntly, more handsome than the majority of the politicians it represents. This is a common feature that researchers have observed with composites. Average faces tend to be subjectively more attractive than most of the individual faces fed into the software. Blemishes and wrinkles are blurred out and symmetry is enhanced. We did, however, analyse which politicians most resembled our average face; one candidate might be Democrat Chris Van Hollen (maybe if you squint...it's not quite a perfect likeness). There are other immediately notable things about the US politicians’ composite face: the gender, for example, and race. You’re looking at a man who is clearly white. The composite face’s skin tone is, of course, far from scientifically calculated. The result can change depending on the lighting and adjustments used in the individual photos. Skin shot in natural light, for example, might look paler than skin shot in a darker setting. Still, dig a little deeper into the data about the demographics of Congress, and it’s not hard to see why the average face came out with the tone it did. 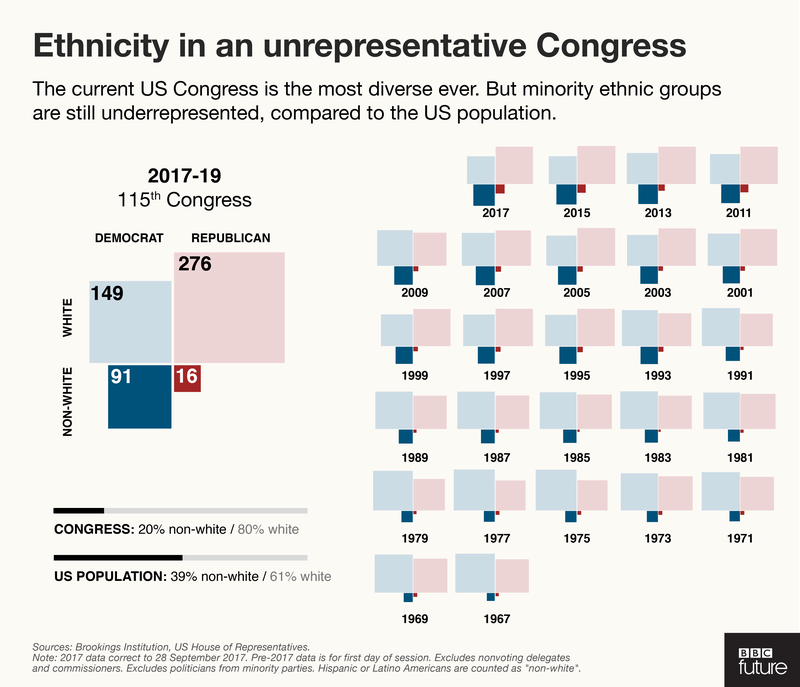 While the 115th Congress has a greater mix of ethnicity than ever before, it is dominantly white: 80% in total, not including Hispanic politicians. This is a higher proportion than the US population, of whom 61% are non-Hispanic white, according to census data from 2016. There are also significant differences in diversity between the parties. According to the non-partisan Brookings Institution, 95% of Republicans in 2017 are non-Hispanic white, compared to 63% of Democrats. Of the 47 African-American members of Congress, the vast majority, 44, are Democrats. All 13 Asian-Americans are Democrats too. The 38 Hispanic members of Congress are slightly more evenly split across the parties: 28 Democrats and 10 Republicans. Even so, you might wonder why the two faces above look so similar in their broad features when they’re based on different datasets. This is a result of the averaging process. Identifying features of individuals such as big ears or noses tend to be lost unless they’re particularly common. Look closer, however, and you’ll see that the Democrat face has fuller lips, darker eyes, and a slightly thinner face than its Republican counterpart. Are there any other visual differences between the two main parties? While it’s not necessarily apparent from the faces above, there is some evidence that individual Republicans may look subjectively more ‘powerful’ to some people. In 2010, Nicholas Rule and Nalini Ambady at Tufts University found that study participants could accurately identify the party affiliation of a Democrat and Republican Senator by their face alone – but, intriguingly, not because of skin colour. After surveying the participants in their experiment, the researchers concluded that people perceived Republicans as having “powerful” faces (dominant and mature), and Democrats as having “warmer” faces (likeable and trustworthy). However, the researchers did note that the results of their experiment may have turned out differently with different participants: the majority of respondents were liberal residents of the north-eastern US. Another difference between the parties – which can arguably be seen in the subtly more feminine features of the Democrat face above – is gender. One third of Democrats are women, compared to only 9% of Republicans. For both parties, of course, that’s still far off the 50% split that would be representative of the population. While the number of women in power is increasing – and although there hasn’t been an all-male Congress since 1919 – only 20% of the current members of Congress are women. The UK, incidentally, can’t claim to be much better: while the British have had two female prime ministers, only a third of current MPs are women. A final finding that emerges from our face composites is the apparent age. While the wrinkles are smoothed, the average face – particularly the male-only face above – is clearly middle-aged. This may come as no surprise. The youngest member of Congress is 33-year-old Elise Stefanik, the Republican representative for New York’s 21st Congressional District. But she is a relative outlier: the median age of all representatives is 60 years. And around 33% of Congress is aged 65 and over, compared to 14% of the US population. Some are even older. Democrat John Conyers of Michigan’s 13th District is 88 years old. In recent decades, Congress has made progress towards becoming more representative. But it clearly has a long way to go before it mirrors the US population. This matters because political decisions shape lives and futures. The best way for decision-makers to understand how they shape lives, of course, is by understanding the people they represent – which, in a diverse society, means having many different backgrounds and points of view. And that, in turn, can support greater political engagement among voters. Only then can a democracy claim, as Lincoln said, to be truly of the people, by the people, for the people. Additional research by Miriam Quick. To learn more about how face averaging is performed, visit this tutorial by Satya Mallick at LearnOpenCV.com.